K M Basheer's educational qualifications make him an unlikely leader of a medical movement. He has not studied beyond Class X. But this farmer from Nilambur in Kerala's Malappuram district heads a society that arranges for home and neighbourhood-level care for the chronically ill. His venture, the Nilambur Palliative Care Society, has inspired several other groups. School kids, senior citizens, labourers, farmers, housewives and even policemen dress wounds, compress sores and sit with patients listening to their troubles and fears. There are doctors as well. Since 2001, these groups of volunteers have come together under the Neighbourhood Network in Palliative Care (nnpc). In 1998, Basheer, inspired by the doctor who had trained him in primary health care in a Nilambur clinic, went around his village with a group of friends, identifying the chronically ill. "Most of them were very poor. Prolonged treatment and huge medical bills had broken their families. We had to address their financial needs as well," he recollected. Basheer and his team sought the help of local people. Most were willing to help. In one year, he had 60 trained volunteers and the ranks swelled the following years. The Nilambur initiative spurred on several similar societies in Malappuram and by 2000, 70 per cent of the chronically ill in the district did not have to visit a hospital for palliative care. nnpc today has a network of about 150 such clinics supported by 10,000 trained volunteers, 85 doctors and 270 nurses looking after about 25,000 patients at any point. In Malappuram alone, there are 29 palliative care societies, and 25 of them have their own clinics with paid part-time doctors, auxiliary nurses and own homecare vehicles. Each unit serves four to five panchayats. "Seventy per cent of the chronically ill in Kozhikode and Wayanad districts do not require a hospital visit for palliative care. The figures for the state are about 20 per cent. Compare this with the rest of the country where only 2 per cent of the chronically-ill receive home or neighbourhood care," said Anil Kumar Paleri, honorary secretary, India Association of Palliative care. "Under the watchful eyes of the community, the quality of palliative care has improved. The problem is the lack of full-time and trained doctors." But according to K Sureshkumar who heads the Institute of Palliative Medicine in Kozhikode, "nnpc is a volunteer-driven movement, which tries to empower local communities to take care of their chronically ill. Doctors have only a secondary role in the movement". At Sureshkumar's institute, volunteers enroll for a 16-hour training programme, which includes nursing, counselling, effective communication, clinic administration and organizing awareness programmes. After completing the training, community groups of 10-15 volunteers are formed who identify the problems of the chronically ill in their area and organize necessary support for them. Since the volunteers are from the same locality they develop strong bonds with the patients and their families. Said 42-year-old Velayudhan, paralyzed waist-down, "I cannot imagine what would have happened to me without them." Many volunteers have much better administrative and organizational skills than the average health care professional, said Mathews Numpeli, nnpc's programme executive. Though initially the programme focused on patients with advanced cancers, it now includes geriatric problems, degenerative neurological disorders, chronic infectious diseases and even chronic psychiatric disorders. Since most of the patients are poor, volunteers often financially support their families and provide rice, provisions, clothes, books and fees for school children. "We divide the patients into very poor, poor, middle class and well-to-do groups," points out V C Ramla, a volunteer in Malappuram district for 15 years. "People from the first two groups are given all sorts of support, including monthly quota of rice. Those from the other two groups are given only medicines, nursing care and emotional support." Every service, including doctor's consultation and some medicines, is free of cost for all. Money is not a problem. Most of it comes from the community itself as small donations. Some donations are of Re 1 a day--some even less. Labourers, headload workers, auto rickshaw drivers, government employees, teachers, and even school kids make small donations to keep the movement going. In Nilambur, for example, the four-person crew of each bus that enters the bus stand donates 50 paise a day. Each day, roughly Rs 500 is collected from this source. Government employees contribute Rs 10 on the salary day, students save Re 1 a month and head loaders leave whatever small change they have at the end of the day. 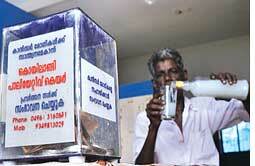 Even toddy shops have donation boxes. 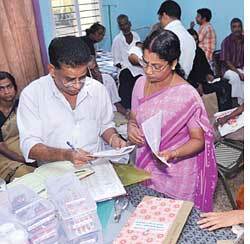 "On an average, Malappuram district raises Rs 10 lakh every month," Mathews said. "The palliative care corpus has increased 10 times after nnpc was initiated," he added. Support comes in other forms too. Panchayats, municipalities and corporations contribute to the initiative. "The Omni which we use was donated by a well-wisher," said 27-year-old T K Muhammed Younus, a marketing manager by profession, who heads the Koilandy Palliative Society in Kozhikode district. "People support because they know they are the beneficiaries. They know the money won't be misused," he added. In 2008, Kerala came out with a palliative care policy--the first such policy by a government at any level in Asia. The policy emphasizes the community-based approach to palliative care and considers home-based care as the corner stone of the palliative care services. It highlights the need for integrating such care with primary health care. "The emphasis is on training professionals and non professionals including volunteers, setting up palliative care services in the public sector and in the community, integrating palliative care into the activities of panchayats and making essential drugs available," Viswas Mehta, health secretary of Kerala, said. The Kerala chapter of the National Rural Health Mission (nrhm) has initiated a project for the development of the community based healthcare services for bedridden, elderly, and chronically and incurably ill. "The Rs 4-crore project is the largest palliative care project in India and the only palliative project under nrhm," said Mohammed Saif, the manager of the palliative care component of Kerala's nrhm. "Kerala has integrated the services of 26,000-odd government-accredited health activists with the community-based palliative care units," Mehta said. nnpc's success has inspired local self-government institutions. The Malappuram district panchayat has formulated a joint home care programme with nnpc groups--Pariraksha. This programme will support 20,000 chronically ill patients, according to Salim Karuvambalam, Health Standing Committee chairman of the district. The gram sabhas have become more active now, and the local bodies take into confidence nnpc groups while formulating health projects. Kerala's example of palliative care has won global recognition and the who is promoting it as a model for developing countries. But can this model work in other parts of the country? "It might not," according to Paleri. This is because Kerala has achieved total literacy and has a high level of social and political consciousness. But he suggested that the community-based efforts here could be taken as prototypes and new models could be developed in other places.